A suite of brochures explaining the wider benefits of the Olympics to Londoners is due to launch in the autumn, with a design by Unreal. The publications could reference the future Olympic 2012 games logo through tone of voice and visual cues, providing a first glimpse of the Wolff Olins-designed identity, which is due to be unveiled within a year. ‘The tone of voice will be youthful, reflecting what is supposed to be the youngest ever Olympics brand,’ says Brian Eagle, creative director at Unreal. The project is being undertaken by Mayor of London Ken Livingstone as part of a Greater London Authority initiative. 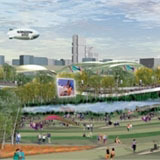 It is also being backed by the London Organising Committee of the Olympic Games and Paralympic Games. A series of six separate publications will seek to communicate the value of the Olympic games to London’s residents, explaining what they mean for the city in terms of infrastructure, funding and culture and transportation, according to Eagle. The distribution channels are still being ‘worked through’, according to Jason Cross, marketing manager at the GLA. Unreal is on the GLA design roster. A spokeswoman at LOCOG confirms that the Wolff Olins identity is ‘moving ahead well, with the aim of launching a brand position and design at the end of the year or early next year’.